Charles de Gaulle Airport - also known as Paris Roissy - has three modern terminals offering travellers quality facilities and services. 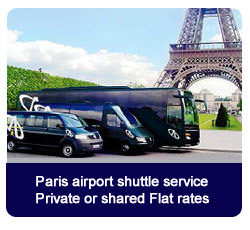 Please find here below the cost of transfer from CDG to Paris city center, suburbs, another airport or Disneyland. Metered Taxis are waiting in front each arrival terminals (1, 2 or 3). Prepaid shuttle service is also available and either operated in shared or private vans - always at flat rates. Thank you for your visit. If you are looking for an alternative to expensive Parisian taxis or the hassle of taking the RER train, you are at the right place! Though other Paris airport shuttle service - such as those of Air France and Roissybus - can also take you to the city, they will drop you off at the Arc de Triomphe or the Paris Opera. From there, you will still need to take a taxi, bus or subway to reach your destination. Licensed by the French Ministry of Transportation, Airport Connection's fleet of air-conditioned, non-smoking vehicles operates out of Charles de Gaulle, Orly and Beauvais airports — 7 days a week, 365 days a year. Ideally suited for the individual traveler, family, or large group, we offer you the choice of a shared or private 8-seater minivan, as well as our private 15-person minibus or 49-person coach. 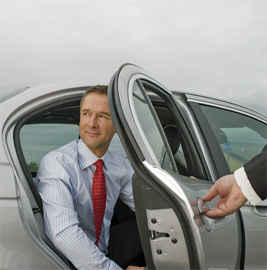 Book your CDG airport taxi at flat rates.